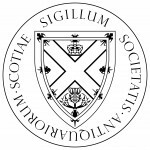 Itchy Coo have been doing a sterling job translating bestselling childrens’ books into Scots for 17 years and we love to keep an eye on what authors they seek out to get the Itchy Coo treatment. 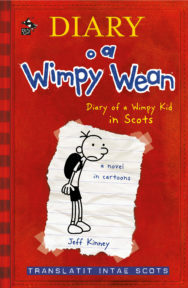 Reading Jeff Kinney’s Diary of a Wimpy Kid in Scots had us fair roarin’ in the office, and we hope you love this little taster too. Braw. Aw I need is for some bam tae spy me cairtin this book aboot and get the wrang idea. The ither thing I want tae get oot the road is that this wis ma MAW’s idea, no mine. But she’s no richt if she thinks I’m gonnae be writin aboot ma “feelins” or ony o that. Sae if ye’re waitin on me giein it aw “Dear Diary” this and “Dear Diary” that, ye can awa and rin. Nae nae kiddin, I’ll be famous yin day. But for noo I’m stuck in high schuil wi this bunch o eejits. And can I jist say for the record that I think high schuil is the dippitest idea ever inventit. On wan haun, ye’ve wee stank-dodgers like me that hivnae even hit their growth spurt, and then ye’ve these muckle gorillas that are needin tae shave twa-three times a day. And then fowk wunner whit’s wi aw the bullyin in high schuils. If it wis up tae me, like, yer year group wid be based on whit size ye are, no whit age. But I dout then ye’d hiv yer lads like Chirag Gupta that’d still be in Primary Wan. The day’s the first day o schuil, and the noo we’re aw jist waitin on the teacher tae hurry up and feenish the seatin chairt. Sae I decidit tae pit a few thochts doon in here jist tae pass the time. HOPE YE’RE AW HAPPY WI WHAUR YE’RE SITTIN, CAUSE THESE ARE YER SEATS AW YEAR. And that’s you sittin there wi Chris Hosey in front o ye and Lionel James up yer back. Jason Brill stoatit in five meenits late and he wis aboot tae sit tae nixt tae us and aw. But I managed tae pure hunt him at the last meenit. See nixt period? I’m scoofin masel a seat wi aw the bonnie lassies the meenit we step in the door. But I doot if I dae that, it’ll jist gaun tae shaw I hivnae lairnt a thing fae last year. Ach, I dinnae ken WHIT the story is wi lassies these days. When we were in primary schuil, it wis aw deid simple. Deal wis, if ye were the fastest rinner in yer cless, ye got yer pick o the lassies. And in oor Primary Six, the fastest rinner wis Ronnie McCoy. It’s aw a lot mair o a fankle nooadays, but. Noo it’s aw aboot the kind o claes ye wear or how mintit ye are or if ye’ve a nice bahookie or whitever. And louns like Ronnie McCoy are staunin there wi their heids birlin, wunnerin whaur it aw went wrang. The maist popular laddie in oor year is Bryce Anderson. Pure does ma heid in. See, I’ve AYEWEYS been wan for the lassies. But lads like Bryce and that hiv anely caught on in the past couple o years. I mind how Bryce uised tae cairry on back in primary schuil. But dae I get ony thanks for stickin up for the lassies aw this time? Dae I chocolate. Like I says, Bryce is the maist popular laddie in oor year, sae aw us ither louns are stuck fechting it oot for the ither places. Noo, faur as I can suss it aw oot, I’m somewhaur aroond 52nd or 53rd maist popular this year. Guid news is, but, I’m aboot tae shoot up a place, because Charlie Davies is aheid o me, and he’s gettin his braces nixt week. I try tae gie the skinny on aw this popularity stuff tae ma pal Rowley (wha’s like as no floatin richt aboot the 150 mark, by the by), but wi him it jist gans straicht in wan lug and oot the ither.